This article criticizing Field Marshall Tantawi was banned by the Egyptian government. The banning of an article criticizing Field Marshall Tantawi has raised all sorts of hackles in Egypt, reinforcing the sense that there is a red line journalists must not cross in criticizing the military. 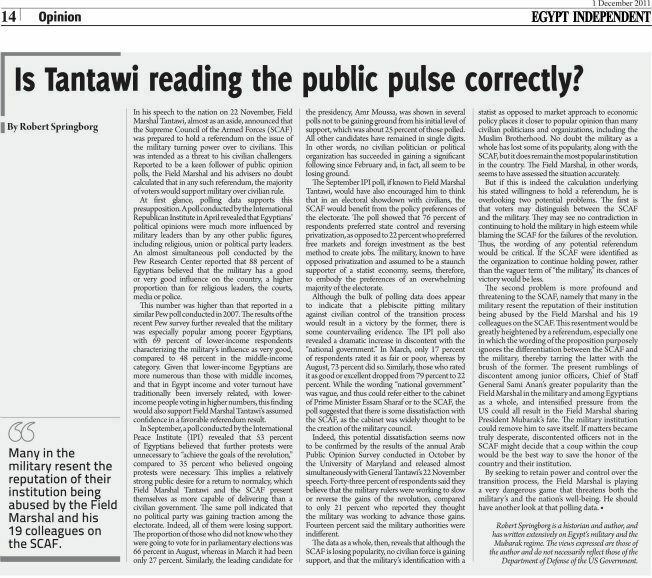 Entitled “Is Tantawi reading the public pulse correctly?” the article was written by U.S. Egypt specialist Robert Springborg, who teaches in the Department of National Security Affairs at the Naval Postgraduate School, and serves as Program Manager for the Middle East for the Center for Civil-Military Relations. He’s the author of an early book on the regime, Mubarak’s Egypt: Fragmentation of the Political Order (Westview, 1988) and has been writing about Egypt for decades. In this op-ed for the 1 Dec. issue of the Egypt Independent, an English weekly newspaper, he suggests that Tantawi is walking a risky line in his actions, and that he may be misreading the public mood. He further states that Tantawi is out of step with many of his fellow military leaders, who feel he is hurting the reputation of the military with the Egyptian people. Springborg suggests that discontented military officers might even pull a “coup within a coup” and overthrow Tantawi in order to save themselves. These ideas are hardly original. Many of us have been saying for some time that the military is fragmented and should not be seen as a monolith. Nonetheless, Tantawi was not amused to find this being said in an Egyptian newspaper, even an English language newspaper (English papers have always been given more leeway than Arabic media). And suddenly, the editors of Egypt Independent got a call from Magdi el-Galad, editor of Arabic sister paper Al-Masry Al-Youm, and editor-in-chief of the Independent, telling them to kill the issue, and trash an entire press run of more than 20,000. Two days later a modified version of the op-ed ran on the web site of the Egyptian Independent, making the same basic case–that poll data suggests Tantawi may be steering the wrong course–with all suggestion of dissension within the military leadership removed. It’s interesting to compare it to the version pictured to the left–especially the second to the last paragraph. We have stopped putting together the weekly print newspaper until we have a license guaranteeing our independence from the Arabic newspaper and resting all legal liabilities on our own shoulders. Even once we have this, we will continue to strive to maintain the highest standards of honesty and integrity. We are ready and excited for Egypt Independent to return to the newsstands. Our shaky beginning has not set us off course. It has taught us. On Dec. 7, al-Masry al-Youm, pblished an unsigned editorial under the title, “The British Independent Publishes a Fabricated Article About al-Masry al-Youm.” The editorial accuses The Independent‘s Cairo correspondent, Alastair Beach, of being linked to Western intelligence agencies, and alleges that Robert Sprinborg, author of the offending op-ed pieces, was seeking to foment a coup d’état by suggesting that one might happen.